I thought i share some thoughts here, on my current dillema. I noticed i must have a pretty noisy AC line when some transformers started buzzing ( in my previous house, none did). So i went on and tried to solve this as i could, with DC block filters and most recently a PS AUDIO Premier : an AC regenerator. This product converts the incoming AC signal to DC, and then regenerates a new "clean" AC wave at 230V. It has a monster 1.2kVA toroid in it. I removed all electronics from the "stereo" line. Only audio products are connected to this fuse box jumper. Fast forward, i thougt this would solve all AC problems. It does not. All the other components (Processor, PRe-amp, other power amps) are also connected to this PS AUDIO. Whenever i turn ON or OFF my electric blinds (curtains) i get a sharp loud sound from the speakers. Like a burst of noise introduced in the line. This only last for a fraction of a second (when turning ON or OFF). Still, how would the electric motor for the curtains induce so much noise in the AC line, that this is carried on through the AC regenerator, through the MAyas....onto the speakers? PS. I may need to test if the noise is coming directly in the MAya through the AC , or through the RCA !? Still..... strange. Whilst there may be some disturbance put onto the mains, this will be rejected by a large amount by the PSU system inside your amp. The noise is probably rf picked up by your interconnect. 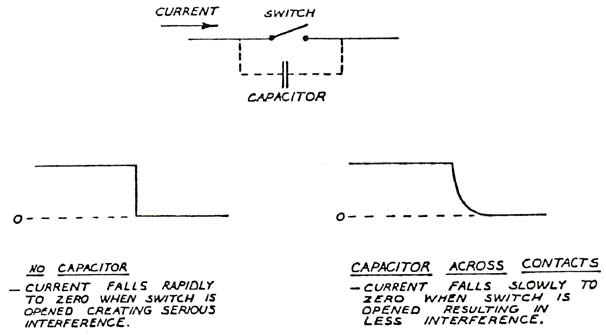 Best option is to quench it at source by suppression capacitors. It is nice that you now have that nice PSAudio regenerator for your audio AC and can only make the audio system better. But it looks to me like you could use an electrician to come out and give an assessment on isolating the curtain motors so as not to interfere with the audio system. There should be several different options for doing this and they all pretty much require an electrician to properly perform the tasks. Last edited by stvnharr; 9th January 2018 at 01:02 AM. that this is carried on through the AC regenerator, through the MAyas....onto the speakers? connected across the switch contacts, rated at more than your line voltage. Last edited by rayma; 9th January 2018 at 02:55 AM. you may try to place a 2 stage emi filter at the power input of curtain. your electric curtain is generating RF noise. All good advice, and thanks for the responses. I think the interference is AC, nothing more, because it only appears when an AC (induction?) motor switches on. Accordingly, a 0.05uF 250VAC self-healing polypropylene AC suppression cap should fix it. This will squelch ('short') the AC emission from the running AC motor. Next step, if this does NOT work, would be to put in a snubber across the primaries of the amp toroids, but it really is best to remedy the issue at source if possible. Thank you all for the positive inputs. I understand a bit of electrics and i know the best practice is to isolate at the source. Still, i noticed this electric motor curtains are not the only noisy appliance i have. My dish washer makes the PS AUDIO regenerator go bezerk ! When the dishwasher starts or stops, the AC regenerator starts switchin into protection mode, and the display jumps from 3% THD to 7% or 8% !! But no noise from speakers when dishwasher is in motion. I am not "bothered" with the electric motor curtains so much. I only actuate them 1 or 2 times per day....so this is not sufficient to start fidling with them. Still...even with the RF induced in the AC line...how is it that the AC regenarator or the Power Supply from the Maya, do not filter them out? The electric motor does not have an easy access. The only indoor part is the switch and could be a 1 pole switch so the cap is no good there. Must take the switch apart and confirm. And because its in WALL, i may not have the space to fit a cap. The dishwhaser could be plugged in through an EMI/RFI noise blocker. I was under the impression the recommended 0.05uF cap would be N and F ( silly). With only the F available at the switch for the curtains, i believe i can acommodate it. I must take it apart and check. Should 2 caps be used ? One for Live and one for Neutral, or if the switch is single pole, only that one should take the cap? You can try an a MOV = Metal Oxide Varistor across the blinds motor. Since you house voltage it is a 250 volts I would use a 300 volts MOV. That will suppress any spikes coming from the starting motor/switch. If you are unsure of what you are doing, stop right NOW. While getting an electrician in may not be as easy as writing some words, trying to get one to come look might be the best option.